The 8x8 storybook space now includes Highlights(TM), the strongest children's brand in the market! 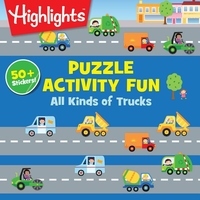 All Kinds of Trucks takes readers along for the ride to see different trucks in action--fire trucks that help people, moving trucks that get people where they need to go, food trucks serving up yummy treats, and more. Kids will love doing the mazes, Hidden Pictures(R) puzzles, matching games, drawing prompts, and other activities featuring more than 50 reusable stickers. The mix of stories and puzzles is the perfect blend for an interactive storybook experience that will keep kids entertained and engaged.